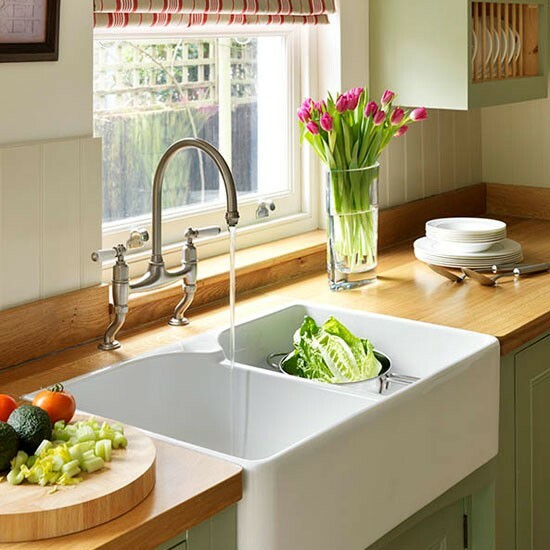 The apron kitchen sinks, also known as farmhouse sinks, are not just stylish but also have a practical past. They have a distinct front-facing side. Their deep basin allowed for plenty of dish washing when there was no such thing as a dishwasher. Basically, it’s a sink that is built-in the counter top and front edge exposed. Which makes it more important than ever to have a nice looking apron sink as it’s a visual part of the design. What is the difference between a farm sink and an apron sink? The difference between an apron sink and a traditional kitchen sink is how the sink sits on top of the countertop or vanity. An apron sink is part of the facing for your countertop. It will slide in and over your countertop, so the front of the sink will be exposed once it is installed. Are all apron sinks undermount? No. You can have an apron sink mounted on the top of the countertop. When the sink and countertop are made from the same material you can blend it and fully intergrate the sink in the countertop. What material are apron sinks made of? You can have an apron sink made of fireclay, stainless steel, copper, cast iron, composite granite, concrete, stone and even wood. Can I have apron sink in a modern styled kitchen? Yes, but it’s not very popular. 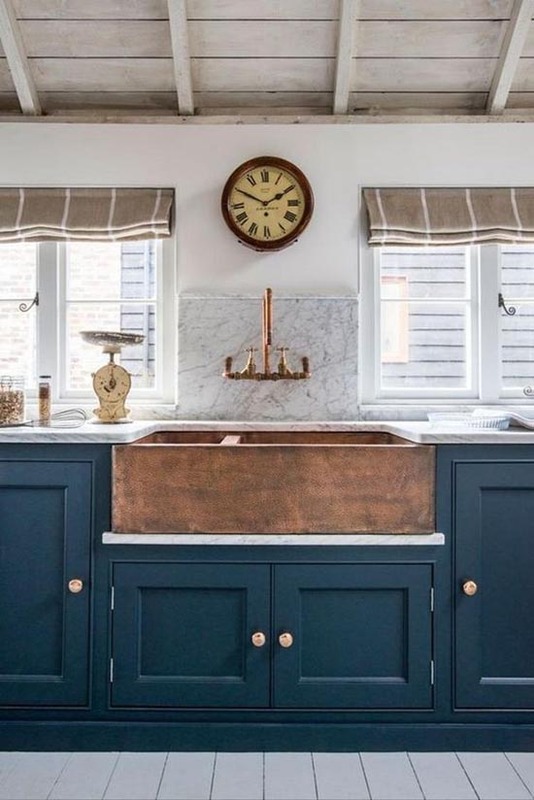 If you can match the apron sink with the kitchen design, go for it. Now, that we covered all the basic information about apron sinks, let’s take a look at the 16 of the best apron front kitchen sinks. The dark color of this small apron front kitchen sink is in a lovely contrast with the light cabinets. The golden faucets give the kitchen a very expensive and sophisticated look. The white color of the cabinets makes this kitchen looks even more spacious than it actually is. The golden accents such as the faucets and the wall scones bring some warmth to the interior. Depending on your own taste, you don’t have to necessarily choose a white apron sink. A black one could be also a nice choice. In terms of both materials and installation costs, the top mount apron kitchen sink is cheaper. However, the under mount sink (like the one on the picture) makes it easier to clean the countertop. Some people are just pushing everything from the countertop in the sink. Plus, it looks so stylish and elegant in this color and size! If you are searching for cheap apron kitchen sinks that are both practical and classy, here is something you might like. This 36-inch apron front kitchen sink made of porcelain could fit both vintage and contemporary interior. Plus, it gives the kitchen a timeless look. This small but deep farmhouse sink in white color is a great addition to this kitchen food prep corner. If the kitchen is very small you can consider installing corner kitchen sink. The basic single-handle faucet makes for easy on-and-off and cleanup. 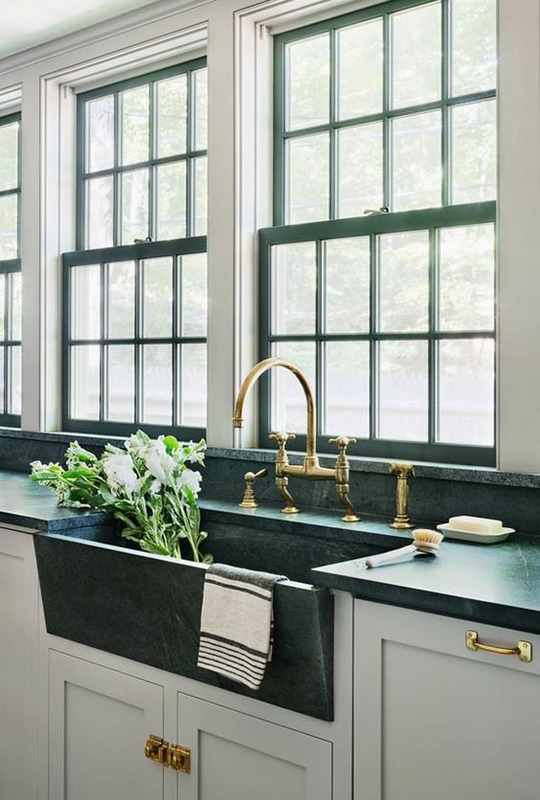 This single glossy farmhouse sink is surrounded by chic glazed countertops. 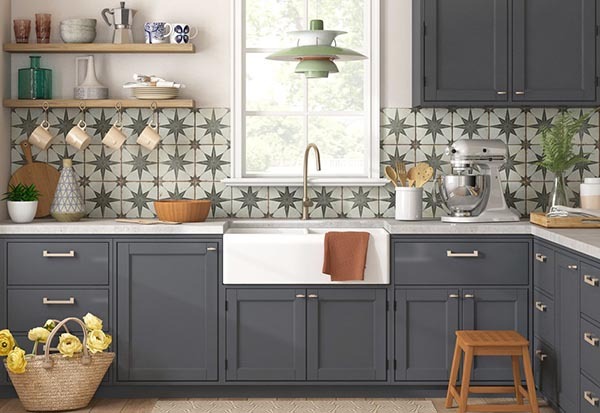 Vintage-inspired fitments, such as the faucet, the cabinets, and the wall decoration continue the unpretentious and elegant style of this kitchen. 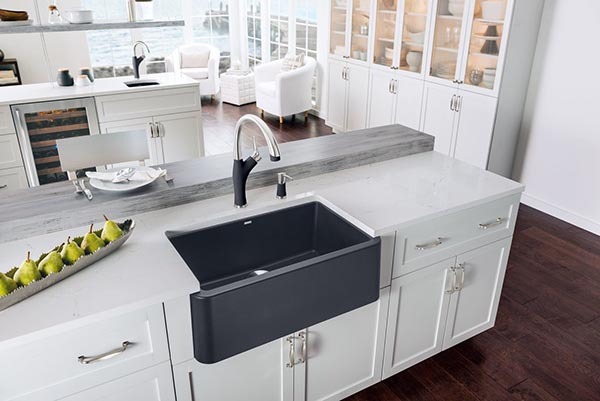 The composite granite sink is usually a bit more expensive than the stainless steel apron kitchen sink, for instance, however, it is very durable and gives a timeless look to the kitchen design. It is produced by using a mix of granite stone dust and acrylic resins molded into a sink form. 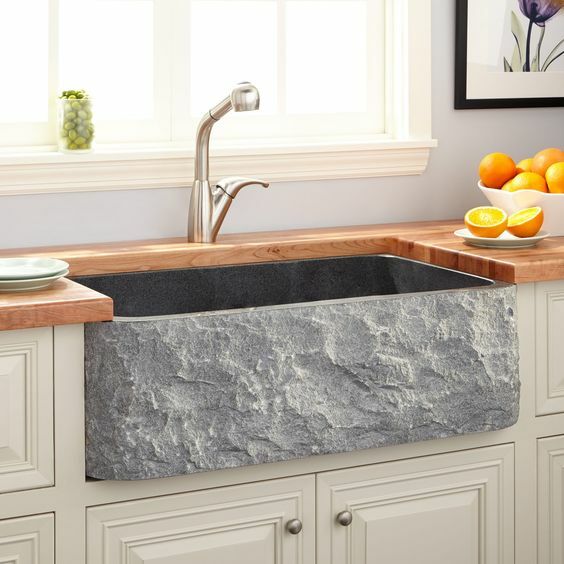 For those of you who are looking for ideas on how to give the kitchen a one-of-a-kind look, take a look at the granite composite apron kitchen sinks. 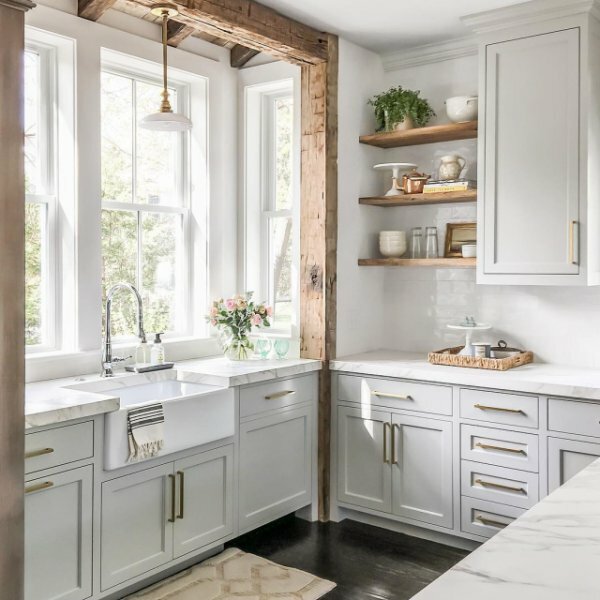 Check out the one on the picture – it looks natural, it fits the wood countertop and the white cabinets (which means it goes with various materials, hooray! ), and last but not least – it’s durable. Unfortunately the texture on the outside is harder to keep clean as it tends to keep dirt. 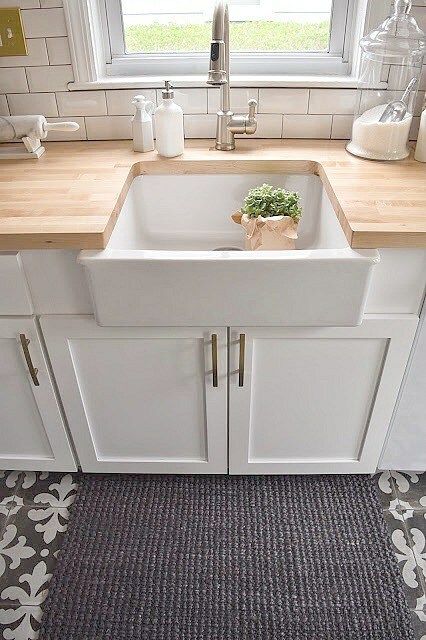 I’ve found this beautiful farmhouse sink in Wayfair’s website. It definitely brings a strong feel of country-style indoors. Thanks to its sharp single basin design, this sink is also suitable for use in a laundry room, as it gives you sufficient room to hand wash delicate underwear. 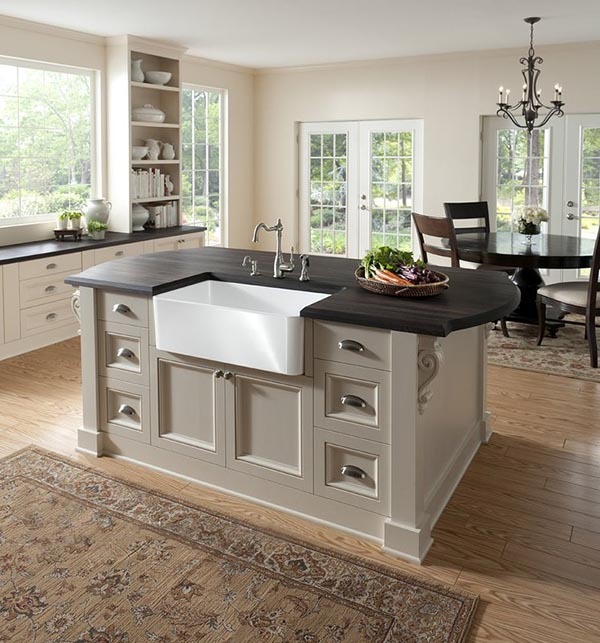 This great double farmhouse sink would give a warm Mediterranean touch to your kitchen space. It’s ideal for big family gatherings as there is enough space to wash the dishes after. I’ve included this design in my list as I wanted to show you something modern yet unpretentious and nice. Cool practical faucet, sink made of a non-porous solid matte stone material, doorless cabinets overhead, and nice dark grey color. 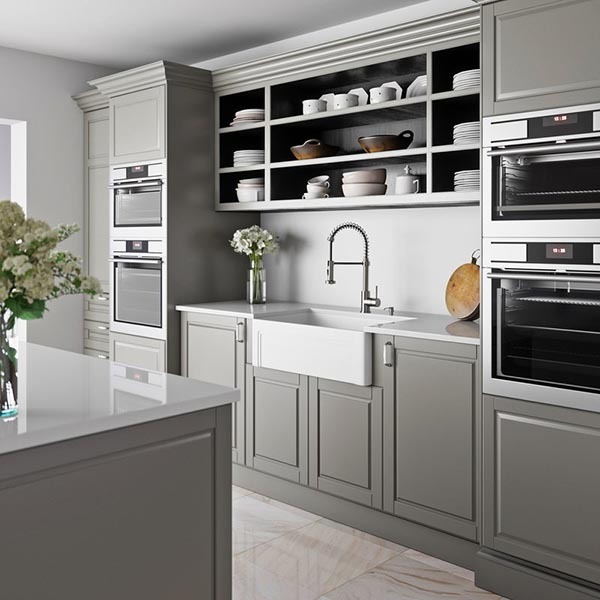 Gray kitchen cabinets are trendy nowadays and can give your kitchen a fresh look. The owner of this beautiful Scandinavian farmhouse told me he has found this granite sink at Wayfair. When I saw the final result of the remodeled kitchen, I was speechless. Love the darker color and depth of the basin. It makes a lovely contrast with the white countertops and cabinets. 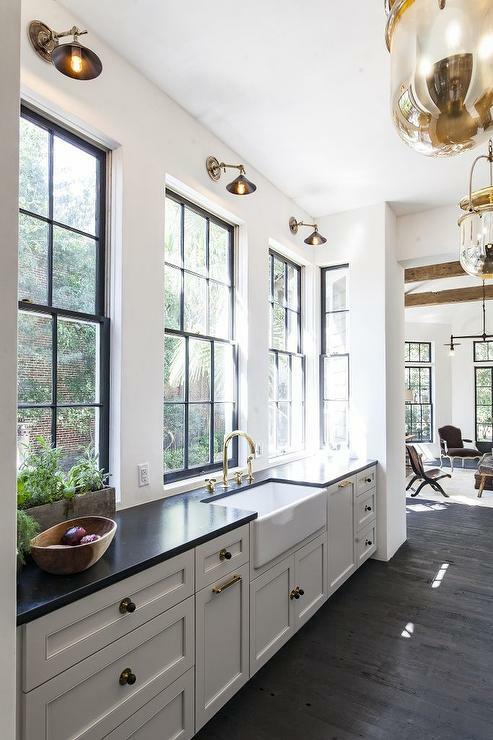 This is so different – an all black chic kitchen with an integrated granite farmhouse style sink. The golden faucets make it look expensive and sophisticated. The apron front copper kitchen sinks have always been my favorite ones. 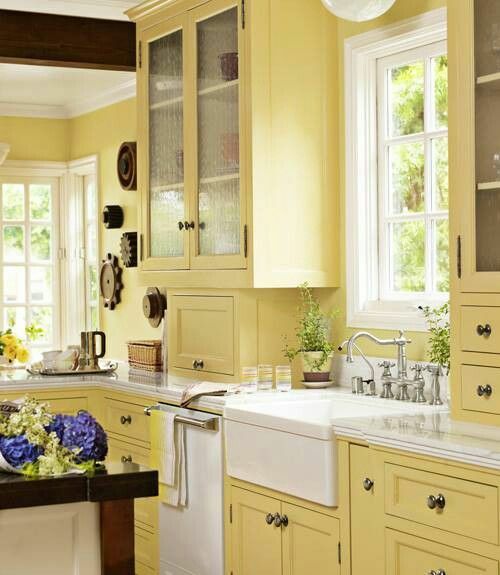 This one, for instance, brings an interesting, one-of-a-kind detail to this cottage kitchen design. Tip: Before considering buying one, educate yourself how to take care of the copper material so it could last longer. 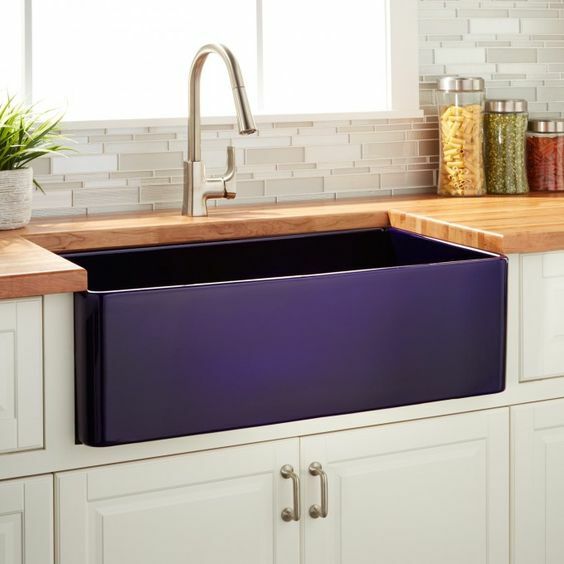 This single sapphire blue apron sink is a bit rustic and also a little modernistic all in one shot. It definitely gives a more welcoming touch to the cooking kitchen area. If you are looking for some cheap apron front kitchen sinks (due to your limited budget), please do not read the last sentence. 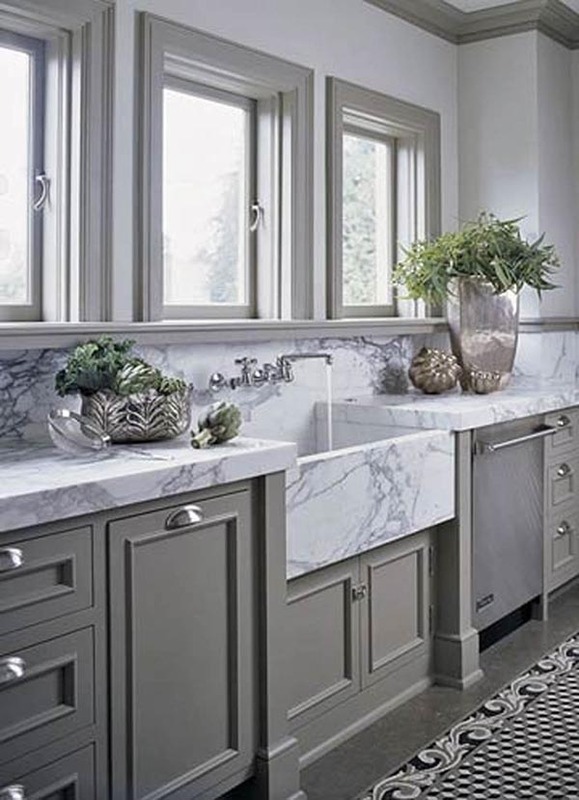 However, the marble sink is always a great idea to give your bathroom furnishing an elegantly edged look. 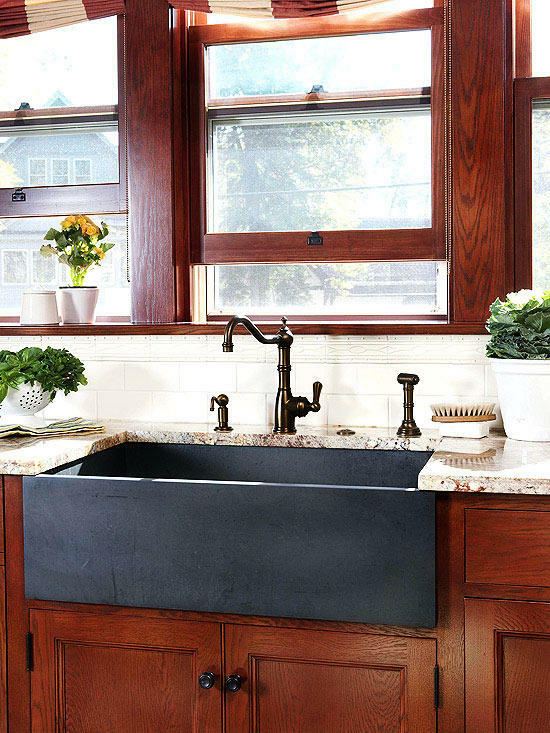 So, are you willing to install an apron sink in your kitchen?